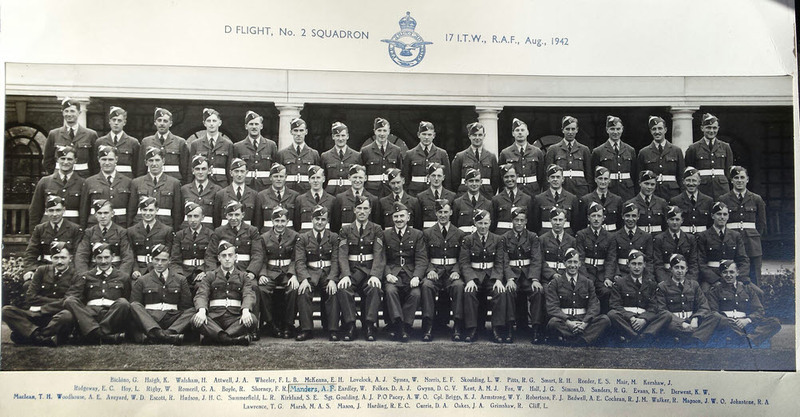 Here we see D Flight of No.2 Squadron, 17 Initial Training Wing, in August 1942. 17 I.T.W. was based at Scarborough from 1941 to 1944, and was used for one of the earliest stating in RAF training. Middle Row: Ridgeway, E.C. - Hoy, L. - Rigby, W. - Romeril, G.A. - Boyle, R. - Shorney, F.R. - Manders, A.F. - Eardley, W. - Folkes, D.A.J. - Gwynn, D.C.V - Kent, A.M.J - Fox, W. - Hall, J.G. - Simons, D - Sanders, R.G. - Evans, K.P. - Derwent K.W. Bottow Row: MacLean, T.H. - Woodhouse, A.E. - Aveyard, W.D. - Escott, R. - Hudson, J.H.C. - Summerfield, L.R. - Kirkland, S.E. - Sgt Goulding, A. J. - P/O Pacey, A.W.O - Cpl Briggs, K.J. - Armstrong, W.Y. - Robertson, F.J. - Bedwell, A.E. - Cochran, R.J.M. - Walker, R. - Mapson, J.W.O. - Johnstone, R.A. Sitting on floor: Lawrence, T.G. - Marsh, M.A.S. - Mason, J. - Harding, R.E.C. - Currie, D.A. - Oakes, J.A. - Grimshaw, R. - Cliff, L.